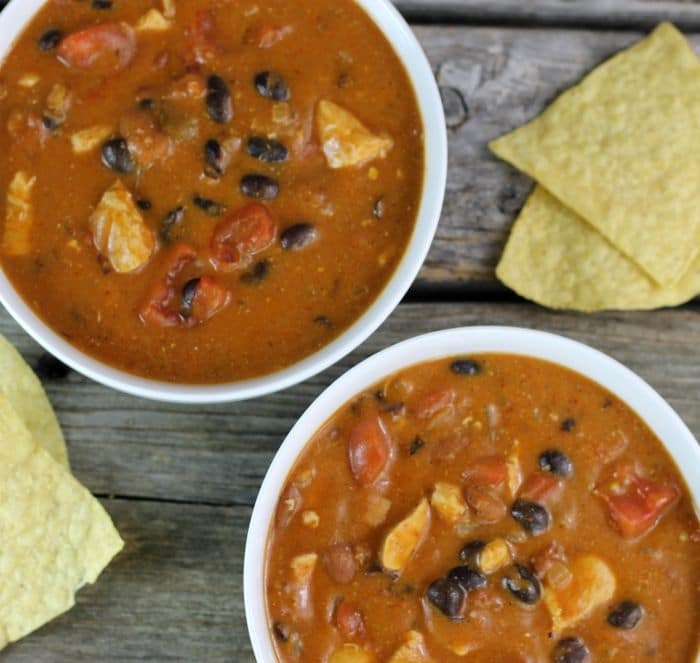 Chicken enchilada chili is super to make and is ready in under an hour. 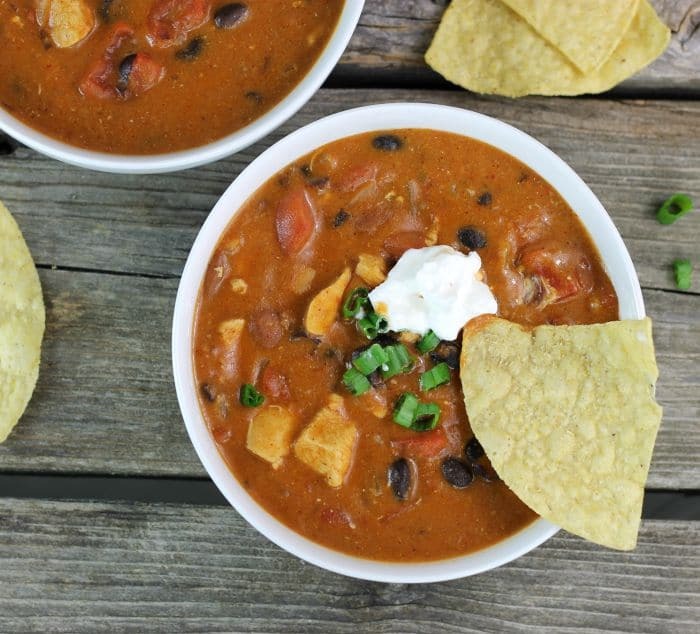 It’s full of flavor and may just replace your current chili recipe. First off I want to wish everyone a Happy New Year. I hope that all your dreams come true in this New Year. I think it is still sinking in that the New Year has started and 2017 is over. Really, how can it be 2018 already? I can’t wait to see what this New Year 2018 will bring. On one of daughter Krista’s last visits home; she mentioned that she had made a recipe for chicken enchilada chili. She said that it was so tasty that she didn’t know if she would go back her basic chili recipe. Since Mike and I enjoy enchiladas, she got my attention. So you are still going to find beans in this chili, because I love beans in chili, but the enchilada sauce takes the chili in a whole different direction. If you enjoy enchiladas, I think you may fall in love with this chili. Along with the beans and the enchilada sauce, you will also find chicken (I guess that is a given since it is in the name of this post), but also there are green chilies, a can of cream of chicken soup, sour cream, chili powder, and cumin. I add the cream of chicken soup because I make a creamy chicken enchilada and in the recipe, it calls for the soup which makes the enchiladas saucy and delicious. 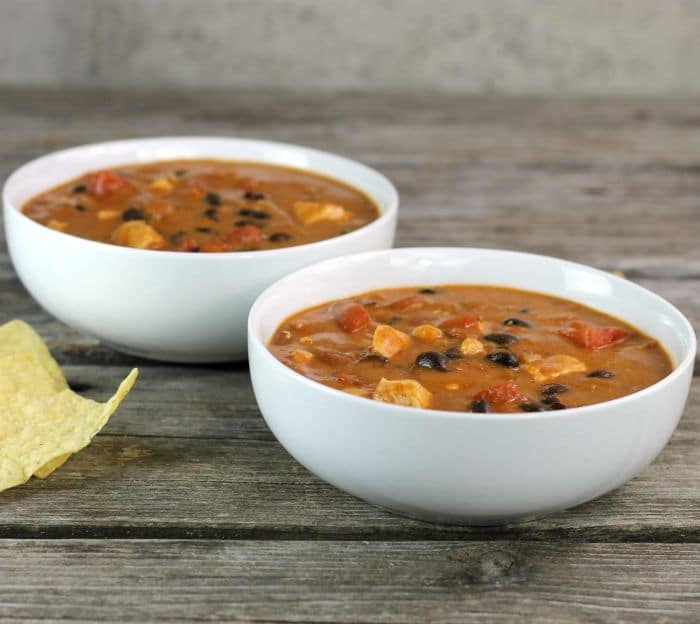 This chicken enchilada chili is perfect for those cold winter lunches or dinner. You may find that you enjoy this twist in your everyday chili. Heat the olive oil in a Dutch oven over medium heat. Add the chicken and onion to the Dutch oven and cook for about 8 to 10 minutes or until the chicken is no longer pink. Once the chicken is no longer pink add the diced tomatoes, green chilies, cream of chicken soup, sour cream, black beans, chili beans with gravy, red enchilada sauce and stir until well blended. Add the chili powder, cumin, salt, and pepper. Bring to a boil and reduce heat to medium-low and cook for 20 to 30 minutes. Serve with additional sour cream, cheddar cheese, green onions, tortilla chips, or your preference. Looks hearty, flavourful and so delicious! Happy New Year, Dawn. This sounds like my idea of a delicious chili, Dawn! What a fun idea to turn these flavors into chili-form. It’s bitterly cold here, and we’re in serious need of warming comfort food. I think a nice big pot of chili could do the trick! Happy New Year, my friend! Well I do like enchiladas so I’m sure I would enjoy this chili. Happy New Year. What a neat idea for chili! We have chili all the time at this time of the year (had some tonight! ), so I gotta try this. Thanks! Hi Dawn, your flavorful chicken emchilada chili look very inviting, it would be very nice to mop up all the gravy with french loaf. :)) Thanks for sharing. 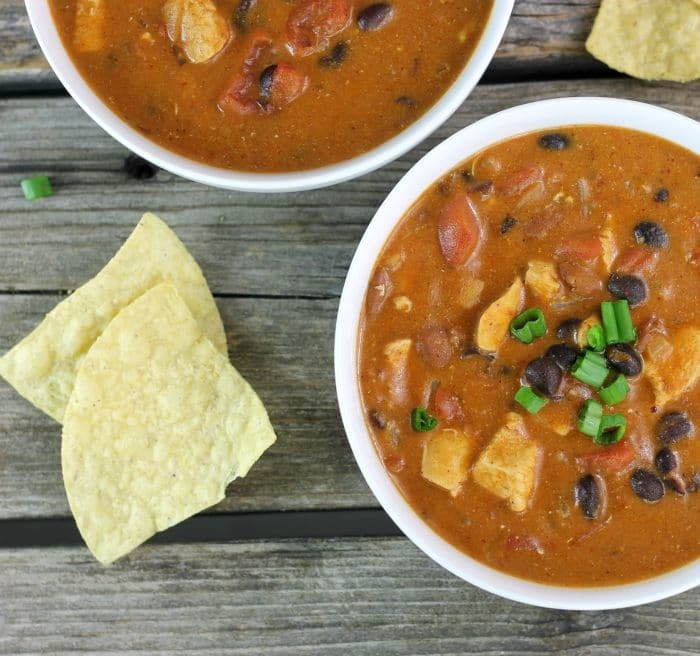 This looks super tasty and perfect for this super cold weather we are having right now! Happy New Year!